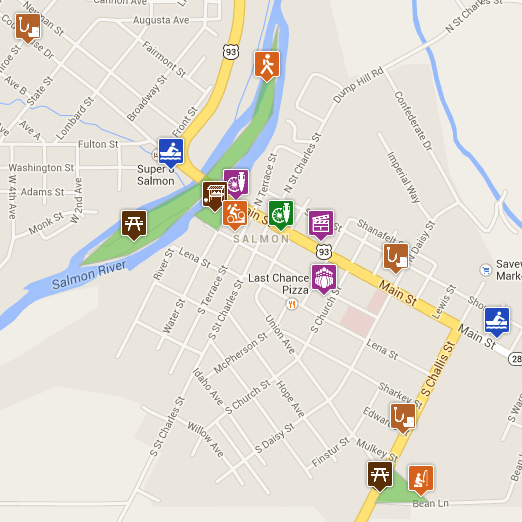 Things to do in and around the town of Salmon, Idaho, from shopping, museums, parks, and more. In the City Park, which is 1.5 miles to the south of the Salmon Bridge on Hwy. 93. Lap Swim and Open Swim Monday-Saturday. Closed Sunday. See site for times. Hosted at Town Square Park at the corner of Water Street and Main, next to the downtown bridge. Salmon is home to a CrossFit box (Lat45 CrossFit), a traditional gym (Fitness 7) and a number fitness and yoga classes. Massages, mani/pedis, and hair stylist services are offered by local beauty professionals. See our Fitness page, or Beauty and Spa page for more information. On the South side of the 400 block on Main Street, next to the Lantern Bar. History Boards and photos of the town and area are available for viewing in an outside setting. Free, walk in. Amenities include artifacts and exhibits, and occasional events. Tours may be scheduled in advance. Amenities include library services, audiobooks, small computer lab with internet access, summer reading program, and more. Hours: Monday-Thursday: 10am-6pm. Friday-Saturday: 10am-5pm. Closed Sunday. Amenities: Visitor Center & Gift Shop, Outdoor School, Meriwether Theater, Outdoor Amphitheater, Heritage Community Gardens, Seaman’s Dog Walk area, Ropes Challenge Course, Research Library. Clubhouse includes cafe with food, beverages and full service bar.Amenities include: Class A PGA Professional, Tournaments, lessons, and clinics, full size driving range, putting green. Gift shops, apparel, art… shop in Salmon. See our Shop page for more information on local businesses. Parks in Salmon, Idaho and Lemhi County offer space to stroll through, relax in, and enjoy. If you want a longer walk or hike, check out the Summer tab on this page. Located on HWY 93, 1.5 miles south of the Main Street bridge in Salmon. Amenities include covered Picnic Tables, Outdoor Grills, Parking, Playground, Public Restrooms, Volley Ball Court. Right next to the City Pool and Salmon Valley Golf Course. Located in downtown Salmon under the bridge. Accessed by road on the west of the main bridge. Accessed by pedestrian bridge from Town Square Park on the east side of the river. The south portion of the island serves as a dog off-leash area for most of the day (excepting 11am-1pm). Amenities include River Access, Covered Picnic Area, Walking Trail, Picnic Tables, Public Restrooms, Skate Park, Dog off-leash area. On the left (east) side of Hwy 93 as you drive south from Salmon, about .3 miles South of the Hwy93/Hwy28 intersection. This park includes a fish pond, stocked by the Department of Fish and Game that boasts both Rainbow Trout and an occasional Steelhead. Off of Hwy 93, about 4 miles north of Salmon on Fairground Road, Salmon, Idaho 83467. Home to the Lemhi County Fair, rodeos, demolition derby, and more. Amenities: Walking Trails, including along the river, Visitor Center & Gift Shop, Outdoor Amphitheater, Heritage Community Gardens, Seaman’s Dog Walk area, Ropes Challenge Course, Research Library. Farmers market held here on Saturdays in the Summer. Small park on the corner of Water Street and Main Street, right next to the downtown bridge. Things to do in Salmon in the summer, from white water rafting to hiking to biking and more. Half, full, and multi-day rafting and fishing trips. Half-day scenic floats, salmon and steelhead fishing trips. Online resource with information on trails, guides, rentals, etc. Disco offers a good network of trails which are marked and signed. A large portion of the trails are intermediate single track. There are some easy and advanced single track sections, as well as some dirt roads. The trail system sits right above town to the north in the sage-brush foothills. For a map and elevation profiles, visit Idaho Lost Trails Blog. To get to the Discovery Hill Trailhead take North St. Charles Street off Main Street in downtown Salmon. Follow it out two miles and follow the signs. Rippey Springs Loop is approximately 10 miles long, mostly intermediate with short advanced sections, and is located to the south east of town off of HWY28. Mulkey Creek trail is an approximately 12 mile round trip out and back with over 2000 feet of climb then descent. To get to Barracks Lane Trailhead, go south on Hwy 28 for 7 miles, then turn right on Barracks Lane, and right again when that lane t’s. The trailhead will be shortly thereafter, on the left. This trail system is about 20 minutes to the south of Salmon. Go 5 miles south of Salmon on Hwy 93 and turn right to cross the Salmon River at the Shoup Bridge, going toward Williams Lake. For maps and more info about individual rides in this system, see Idaho Lost Trails Blog. Salmon is next to millions of acres of hikable wilderness, but we’ll get you started with some shorter hikes close to town. While it’s primarily a mountain bike trail system, Disco offers a large network of trails that are also hikable. The trail system sits right above town to the north in the sage-brush foothills. Check out this map (meant for mountain bikers) for detailed trail info. For less of a hike and more of a pretty stroll, it’s hard to beat the Sacajawea Interpretive Center. The trail at its longest is about a mile. In early spring, some of the trail can be inaccessible due to high river water. Part of the trail follows the river, and other parts offer beautiful views of the Bitterroot Mountains. 2 Miles East of Salmon Idaho on Hwy 28 – turn left (north) at the signs just outside of town. One of the best views of Salmon in the immediate area, this hike is less than a mile long, but fairly strenuous. This hike is a short burn up a dirt quad road on “S-hill” located to the south east of town. You can stop at the “S” or continue up to the top. As a reward for sticking it out to the top, you get an amazing view of both the Salmon River and Lemhi River valleys. To get to the bottom of S-Hill, go South out of Salmon on HWY 93 about .7 miles, and turn left (east) on Cemetery Lane. Follow it until you get to the bottom of the hill, where you can start your hike. Directions: On Hwy93, go 5.2 miles south of the Hwy 93/Hwy28 intersection in Salmon. Turn right (west) and cross a bridge over the Salmon River. Continue on that road for about 2.5 miles, and turn left onto Williams Lake road, crossing Williams Creek. Follow that road (which turns to dirt) until you hit Williams Lake. Facilities include campground, boat ramp, fishing trail and handicap access to picnic area. Motorized boats allowed. Year-round fishing possible. For other ideas, check out the Parks and In Town Fun tabs on this page! Things to do in Salmon, Idaho in the Winter, from cross country skiing to hotsprings and more. Located 45 miles north of Salmon the Chief Joseph Pass Ski area offers miles of beginner, intermediate, and advanced trails. Map. To get to the ski area, head north out of Salmon on Hwy 93 for 45 miles. Turn right at the top of Lost Trail Pass onto Hwy 43 and go for about a mile to the signed Chief Joeseph trailhead area, which includes maps and pit toilets. The trails are groomed for classic (not skate) by the Bitterroot Cross Country Ski Club. There is not always enough snow in the valley to accommodate cross country skiers, but when there is enough, you can make use of the trails at the Sacajawea Interpretive Center. Located 2 Miles East of Salmon Idaho on Hwy 28 – turn left (north) at the signs just outside of town. This system is comprised of about 17 miles of un-groomed trails, marked beginner through advanced, with terrain ranging from gentle to steep. Good online maps for this area don’t currently exist – You can call the Salmon/Challlis National Forest, 208-756-5100. This is a partial map, and some trail descriptions. The trail descriptions page is not user friendly, but has good information. To access the trail system, drive five miles South of Salmon on Highway 93. Turn right at Shoup Bridge and cross the Salmon River. After about a mile, make sure to stay left to head toward the summit instead of heading toward Williams Lake. Starting about 3 miles before the summit, there are parking pullouts that access the trails. Parking and pit-toilets are available at the summit. Man-made concrete pools run through by natural hot springs. Facilities include pit-toilets and changing rooms. No dogs, camping, or glass containers. Located approximately 23 miles southeast of Salmon. Drive south from Salmon on Hwy28 for about 17.5 miles. Turn left onto 17 mile road just past a large beam plant on the left. Turn right onto Back Road. Turn Left onto Warm Springs Road. Stay left at the fork to continue to Sharkey Hotsprings. The springs are about 5 miles from the turn off the highway. The Salmon Hockey Association makes good use of an outdoor rink in Salmon. Check out their site for game times and practice schedules. Located on the 800 block of Lombard Street in Salmon, Idaho. Lost Trail is our local gem of a ski hill. Small and family-owned and operated, this hill offers a great variety of terrain at a very reasonable price. Check out the Shop page and the Fitness and Beauty page for more ideas on what to do in Salmon in the winter!